Rolls-Royce plans to axe 4,600 mainly British management roles by 2020 to further slash costs, the UK maker of plane engines announced on Thursday. "Rolls-Royce announces the next stage in our drive for pace and simplicity with a proposed restructuring that will deliver improved returns, higher margins and increased cash flow," the group said in a statement. The London-listed company, whose engines are used in Airbus and Boeing aircraft, said the latest cuts would produce £400 million ($536 million, 454 million euros) of annual cost savings by the end of 2020. Rolls has faced a tough trading environment in recent years on weak demand for its power systems, in particular ones used by the marine industry, resulting in the loss of about two thousand jobs alongside the creation of new posts. The latest update will result in the largest cull at the group since 2001, when it axed 5,000 jobs on a global economic downturn and following the September 11 attacks in the United States. 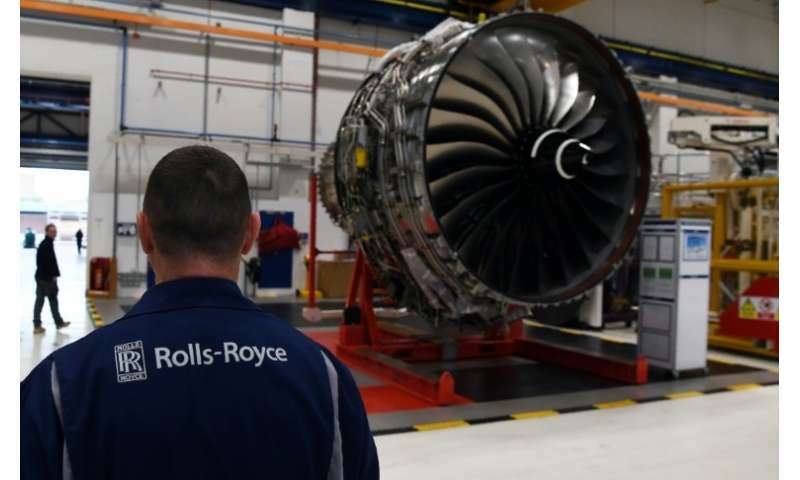 "Our world-leading technology gives Rolls-Royce the potential to generate significant profitable growth," the company's chief executive Warren East said in Thursday's announcement. "The creation of a more streamlined organisation with pace and simplicity at its heart will enable us to deliver on that promise, generating higher returns while being able to invest for the future," he added. Although Rolls roared back into profit last year, this was largely owing to a recovery in the pound. While the plunge in the value of the pound in the wake of Britain's 2016 vote in favour of Brexit helped many exporters, Rolls-Royce was forced to book a vast charge as it had not hedged against such a swing in the currency. Rolls said the latest round of restructuring, leading to the loss of many corporate-supporting roles, was expected to cost the group £500 million, while about two-thirds of the job losses would be in the UK. East, who has implemented a group-wide restructuring since his appointment as chief executive in 2015, insisted that the latest cull was not linked to repairs it has been forced to carry out on Trent engines. Used by the Boeing 787 Dreamliner and Airbus A380 superjumbo, the engines have seen some parts wear quicker than expected, forcing Rolls to carry out costly repairs. Rolls employs about 55,000 staff worldwide, almost half of whom are in Britain. The company meanwhile has some 16,000 staff at its UK operational base in Derby, central England. "Most of these management and support functions (set to go) are in Derby and therefore, it will be most strongly felt in Derby," East said in an interview with BBC radio. Rolls had in January announced a major overhaul of its operations, reducing the number of core units and basing the remainder around civil aerospace, defence and power systems. "We have world-class technology in Rolls-Royce, but... (not) a world-class business to go along with it," East said Thursday in a call with reporters. At the same time, the company has said it would consider selling its commercial marine business, while in April, Rolls sold German division L'Orange for 700 million euros to US group Woodward. Speaking to the BBC, East said he saw opportunities in China. "We look at China and we see an opportunity there for aircraft engine... that's where a lot of opportunities are." Shares in Rolls-Royce rose 2.5 percent to 849 pence in morning deals on London's benchmark FTSE 100 index, which was down 0.7 percent overall. "Reducing costs is typically applauded by shareholders as it tends, in the short-term at least, to boost the profit and cash flow of which they are part owners," noted AJ Bell investment director, Russ Mould.